Nothing in the House: Tart of Gold--Found! I've never really been one for Valentine's Day. I appreciate its pagan origins, and think it's always a nice thing to show and tell the people you care about that you do, indeed, care about them, but seeing all the cheap sentiment for sale in the grocery and drug store aisles makes my stomach turn more than my heart beat. What Valentine's Day has always been about for me, though, is baked goods. 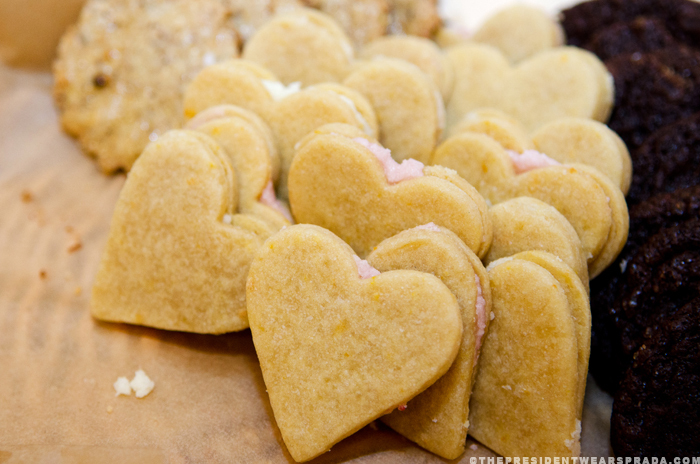 My mom and grandma always made the most delicious and cutest heart-shaped sugar cookies, glazed with red & pink icing--seriously the best you have ever tasted. They continued the tradition through college, where tins of these cookies with homemade valentines would arrive at my dorm room and I'd have to pawn them off on my roommates and neighbors so as not to eat them all. 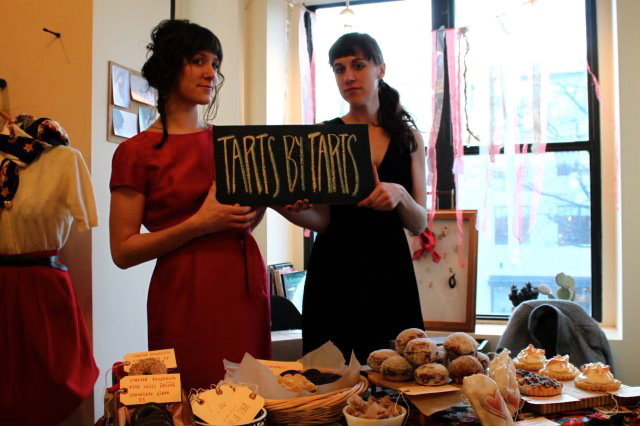 So it seems right that this year, Tarts by Tarts did a special Valentine's Day event--offering up made-to-order tarts-- "hearts by tarts" if you will--and various other baked goods at the Tart of Gold Party at Treasury last Thursday. 1. Follow instructions for Nothing-in-the-House pie crust or your favorite tart crust recipe. Meanwhile, prepare your lemon curd (see instructions below). 2. Preheat oven to 400 and remove crust dough from fridge. Grease and flour 6 tartlet pans. Divide crust into six, roll out, and fit into tart shells. Place crusted tart shells into freezer for 15 minutes. 3. Remove tart shells from freezer. 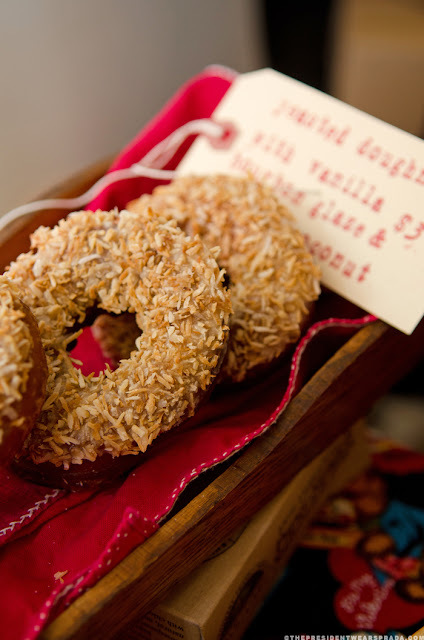 Line each with parchment paper and fill with pie weights or dried beans and blind bake for 15 minutes. Remove pie weights and bake for 5-10 minutes more or until golden brown and flaky. Let cool. 1. Place the arrowroot starch, sugar, lemon juice, lemon zest, grated ginger, white wine, eggs, egg yolks and salt in a small saucepan. 2. Turn the stove on low heat, and with a whisk, stir contents constantly as the curd cooks and thickens. Bring the curd to about 185˚F which should take about 7 or 8 minutes. 3. Once the curd has reached the right temperature turn off the stove and remove the saucepan from the heat. Pour the curd into the bowl of a standing mixer fitted with a paddle attachment. Turn the mixer to high and beat for 30 seconds to cool the curd. Then turn the speed to low and add one tablespoon of butter. Beat until it is melted and fully incorporated. Add the second tablespoon beating until it too is incorporated. Repeat with the final tablespoon. 4. Let the curd come to room temperature and pour it into a bowl or tupperware. Cover bowl and place in the freezer for at least two hours or overnight. 1. Once curd has been chilled sufficiently, divide curd into baked tart shells (I had some leftover curd, which was just fine with me--try it on toast, pound cake or ice cream!). Preheat oven to 350 degrees F. Beat egg whites until stiff peaks form. Add sugar gradually and pinch of cream of tartar. 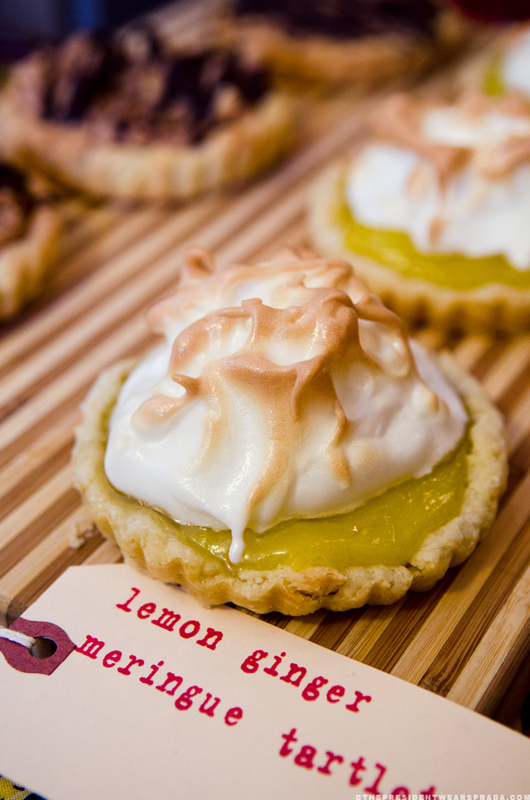 Spread meringue over lemon curd in each tartlet, using the back of a spoon to create curls and peaks. Place tartlets in the oven and brown, 13-15 minutes. Let tartlets cool to room temperature and place in fridge. Serve at room temperature or slightly chilled. Cathy of Treasury called it "the best meringue tart of my life! I loved the crust too and I normally like that part the least." Thanks so much to Treasury gals Joyce, Katerina and Cathy, our friends who helped out and took audio recordings and lent us supplies, our customers who ordered tarts and bought baked goods, and to my awesome tartner Kari! We ended up getting a lot of really nice write-ups from blogs and sites**, including Refinery29, The President Wears Prada (who also graciously provided these pictures), and Panda Head--so thank you to those writers and bloggers too! 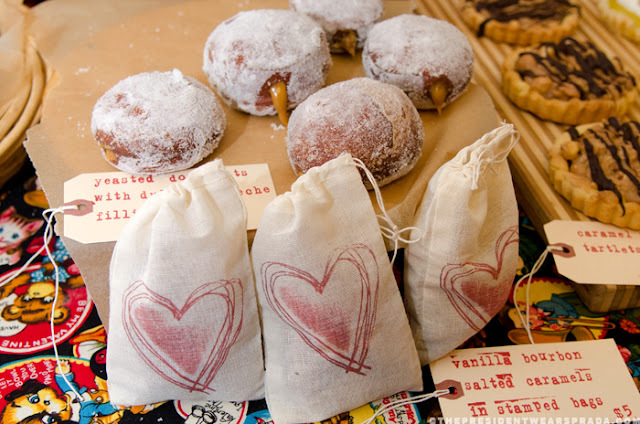 Hope you had a sweet Valentine's day! 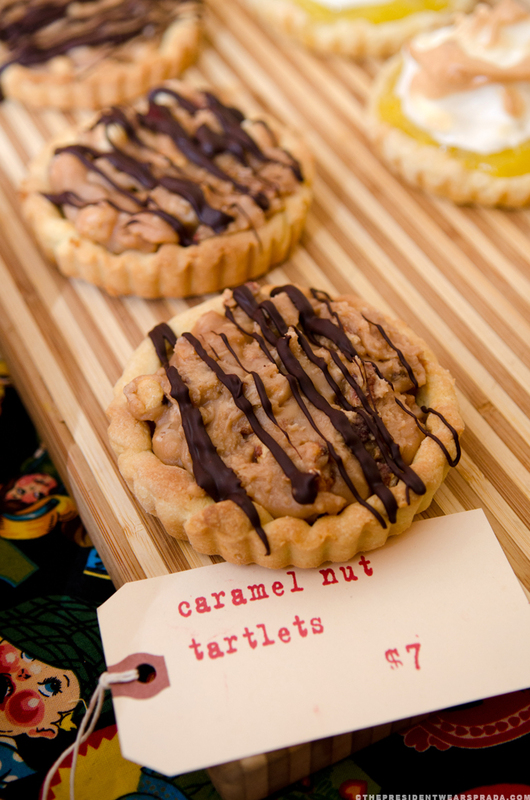 Look for Tarts by Tarts next at the D.C. Square Dance on March 3rd, where we'll be hawking Southern-inspired treats for all the ladies and gents. Of course, that will include pie (maybe even some fried ones too). Our friend DVD made this adorable and hilarious audio piece about the party--a "little synapse of deliciousness for your ears". Have a listen. Thanks to TPWP and Kari for the photos. 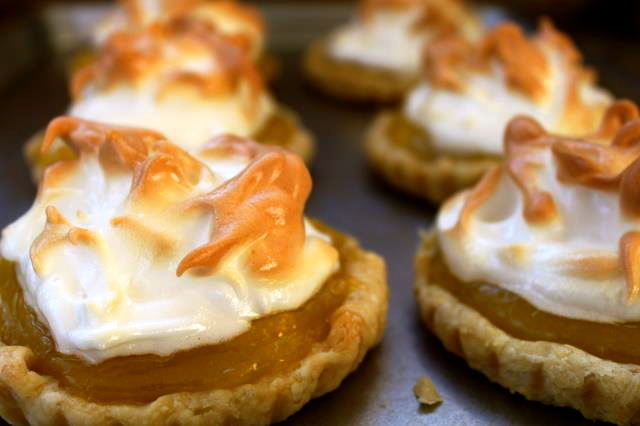 Labels: caramel nut tartlets, lemon meringue pie, lemon-ginger meringue tartlets, Tarts by Tarts, Valentine's, Washington D.C.
you tarts are just the tartiest! this is so cool that you did this. 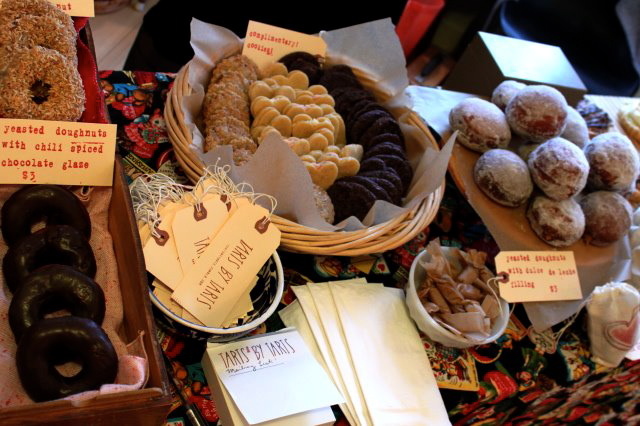 wish i could sample some of these goods (especially the maple orange cookies, holy #%^&#%^*&*). aw, thanks carol! been loving eating sweet and want to make that peanut butter cup tart!! The lemon tarts looks so good...I've got to try them soon! I'm so glad you shared the recipe!